Why doesn’t Sir David Attenborough give credit to God? ‘When Creationists talk about God creating every individual species as a separate act, they always instance hummingbirds, or orchids, sunflowers and beautiful things. ‘But I tend to think instead of a parasitic worm that is boring through the eye of a boy sitting on the bank of a river in West Africa, [a worm] that’ going to make him blind. Sir David Attenborough: ‘Well, if you ask…about that, then you see remarkable things like that earwig and you also see all very beautiful things like hummingbirds, orchids, and so on. But you also ought to think of the other, less attractive things. You ought to think of tapeworms. ‘You ought to think of … well, think of a parasitic worm that lives only in the eyeballs of human beings, boring its way through them, in West Africa, for example, where it’ common, turning people blind. ‘So if you say, “I believe that God designed and created and brought into existence every single species that exists,” then you’ve also got to say, “Well, he, at some stage, decided to bring into existence a worm that’ going to turn people blind.” Now, I find that very difficult to reconcile with notions about a merciful God. This is a theological argument rather than a scientific argument — it is about what a god supposedly would or would not do rather than about the scientific evidence. It’s ironic that Attenborough claims that the Intelligent Design Movement is about theology while evolution is about science, yet his main anti-ID argument is theological rather than scientific! Attenborough ignores the Fall, as do most such critics; God did NOT design things this way, but they became this way after sin entered the world — see Death and Suffering Questions and Answers. The ID movement has problems answering this type of argument because they lack a history, since they refuse to invoke the Bible with its teaching of the Fall (and Flood). Though Attenborough is said on some internet references to have been referring to the Loa Loa sickness, caused by a parasitic nematode filarial worm, this is only very uncommonly the cause of blindness. It is more known for skin lumps and inflammation as the parasite moves through the human host’s tissues. The worms can frequently be seen travelling under the conjunctiva (the thin membrane that covers the eye) but it rarely does harm there. He was (or should have been) referring to the related filarial nematode illness Onchocercosis. Behind trachoma, it is the second commonest infective cause of blindness in the world. Its non-technical name is actually ‘river blindness’—because the biting insect that carries it to and from humans breeds around rivers. When it comes to the clinical facts about this parasitic illness, Attenborough was mistaken in a number of areas anyway. He could have used other examples of natural evil, of course, and the real answer for all of them is basically the same—the Genesis Fall. So what did he get wrong? First, this worm does not live only in the eyeball—in fact it is almost never found there, but rather in nodules in the skin. It is the microfilaria, one of the larval stages produced by the mating of male and female worms, which travel to the eyeball (and many other places, too) and do the damage there. And these microfilaria do not live in the eyeball either; they die there and it is this dying which causes the problems. Even then it is not the worm or its larvae, either. Rather, the Wolbachia bacteria, which live symbiotically in association with this parasite in its several stages, are what does the damage when they are released at the death of the microfilaria, which triggers a severe immune reaction. Attenborough is wrong anyway, because the worm doesn’t need to bore through a child’ eye. Indeed, if it lands there, it can’t even complete its life cycle. But there are numerous other arguments about pathogens and predators that he could have used. 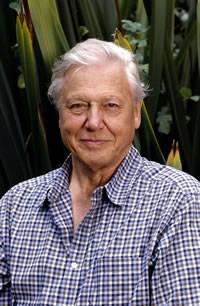 See Sir David Attenborough: so much to live for; nothing to die for! Buchanan, M, Wild, Wild Life, Sydney Morning Herald, The Guide, p. 6, 24 March 2003. Sir David Attenborough interviewed by Andrew Denton, Enough Rope (ABC), Episode 28, broadcast 22 September 2003.